Central Park encompasses 450 acres in the heart of Fremont with activities for the whole family including reserved and drop-in picnic sites, children’s play areas, basketball, tennis, fishing, skate park, boat rentals, and launches. 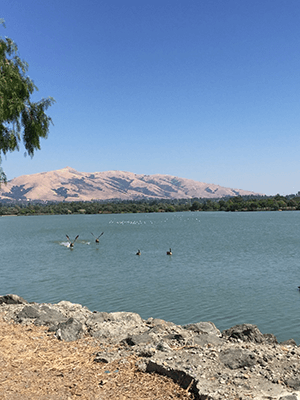 A 2-mile paved, level trail circles 80-acre Lake Elizabeth with Mission Peak providing a backdrop. There’s plenty of parking and it’s an easy half-mile stroll from the Fremont BART station along city sidewalks with curb ramps. Weekends can be quite crowded and summer temps can be high so plan accordingly. Located at Paseo Padre Parkway at Stevenson Boulevard. For more information, click here to visit the park’s website.